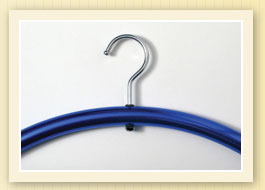 Precision hangers are available with felt for sweaters & knits or without felt for blouses, shirts & jackets. Felt strips prevent stretching and slipping of sweaters & knits but are not needed for other clothing. The 1/4″ hook provides strength and proportion while the stop nut holds it firm when twisting or supporting heavy jackets. 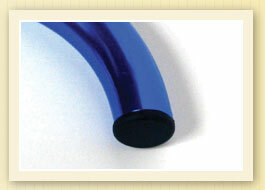 End plugs provide a clean & finished look that serves to add new features to the next generation of precision hangers. 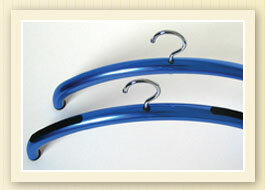 Precision Hangers are made of one-inch anodized aluminum tubes precisely contoured to fit clothing naturally. 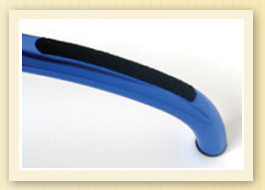 The unique and Patent Pending “D” shaped bend provides support throughout the length of the garment thus eliminating pressure points that cause dimples and creases. The one-inch width distributes pulling pressure over a wider area, eliminating creases formed by narrower square and rounded hanger designs.